Oh, how I adore salt and vinegar potato chips. I have loved these since I was a kid, and I now consider myself a connoisseur of salt & vinegar chips. But being on the Weight Watchers program, I sadly have tried to avoid them, as most of the healthier versions aren’t flavorful enough and the tasty versions are too high in Points and/or loaded with a bunch of awful artificial ingredients. 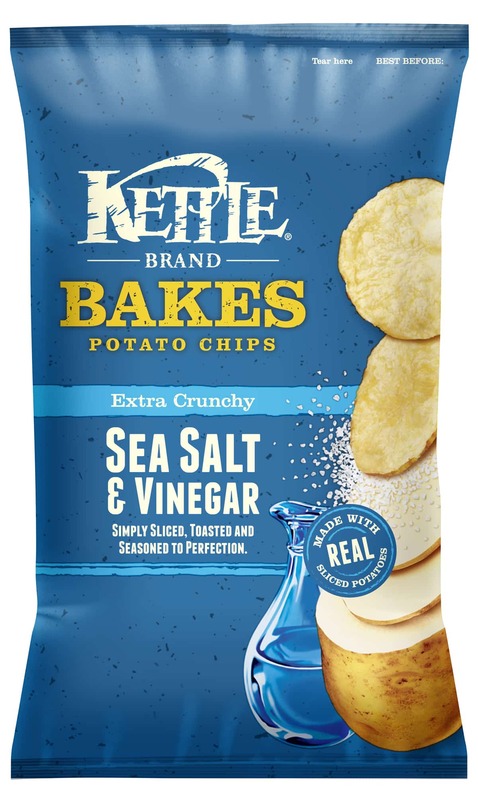 But then, I discovered Kettle Brand Bakes Extra Crunchy Sea Salt & Vinegar Potato Chips, and I was in heaven. Seriously…they are perfection, and I am over the moon in love. And while my favorite way to enjoy them is straight out of the bag on a direct route into my belly, I’ve recently been incorporating them into some Weight Watchers Recipes too! One of the best is this Salt and Vinegar Chip Crusted Fish Recipe. The mild, flaky cod is covered in a crispy coating of these bold and tangy salt and vinegar chips, and the result is total perfection. Salty, tangy and deliciously satisfying, this easy fish recipe is a real winner. The salt and vinegar potato chips make for a perfect, crusty breading. Preheat oven to 400 degrees. Line a rimmed baking sheet with parchment paper and mist with cooking spray. Season both sides of the cod with salt and pepper and place on the baking sheet. In a small bowl, combine the yogurt and the mayonnaise. Place chips into a sealed plastic bag, and squeeze with your hands, crushing them until they are a breadcrumb like texture. Spread yogurt mixture all over the top of the cod, then cover the cod completely and evenly with the crushed chips, pressing gently to coat. Place in oven and bake for about 12-15 minutes until fish is cooked through, depending on the thickness of fish. I am not a fan of Salt & Vinegar chips to snack on but THEY’RE PERFECT for coating fish. Think malt vinegar and fish–great combo. This is a fantastic recipe. I just looked up the recipe as I found some beautiful cod and wanted to make this recipe for the 2nd time. Thank you for sharing! I made this tonight and it was one of the best fish recipes I have tried, WWs friendly or not. I couldn’t find the brand of chips you used so I substituted the Sensible Portions Garden Veggie Chips, Sea Salt & Vinegar. It was amazing. Thank you. I am going to try the Sea Salt and Cracked Pepper chips. This is what I use on my tuna casseroles and it is yummy! Is there another ingredient besides greek yogurt that I can use to make the breadcrumbs stick? I am unable to eat any dairy. Thanks! Yes, you can use Vegenaise…it’s an entirely vegan mayonnaise alternative, and I absolutely LOVE it. I have no problem eating dairy, but I actually prefer Vegenaise over regular mayo any day of the week. I’ve used it in this recipe and it works perfectly :). I’m not a vinegar chip fan, but would maybe try with some other chip flavor, any ideas?